Illegal Trade In Turtles Results In $1,950 Fine. A St. Catharines man has been fined $1,950 for engaging in the illegal trade of turtles. 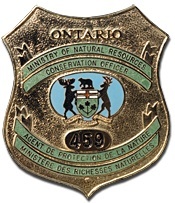 Andrew Fruck was fined $1,950 under the Fish and Wildlife Conservation Act for the illegal possession and sale of eastern musk turtles– a specially protected species in Ontario. The court heard that conservation officers from Aurora and Guelph districts worked co-operatively on investigating individuals unlawfully possessing and selling turtles. During a 2008 investigation, Fruck was identified as the supplier of eastern musk turtles within the pet trade. The charges were based on transactions that occurred prior to, at and following an Ontario Reptile Expo held in Mississauga. Justice of the Peace Mary Shelley heard the case in the Ontario Court of Justice, Brampton, on January 7, 2013. One month after the charges were laid against Fruck, the eastern musk turtle was provided additional protection by the implementation of the Endangered Species Act. To report a natural resources violation, call 1-877-TIPS-MNR (847-7667) toll-free any time or contact your local ministry officer during regular business hours. ← $2,000 Fine and Hunting Licence Su spension for Hunting Violations.